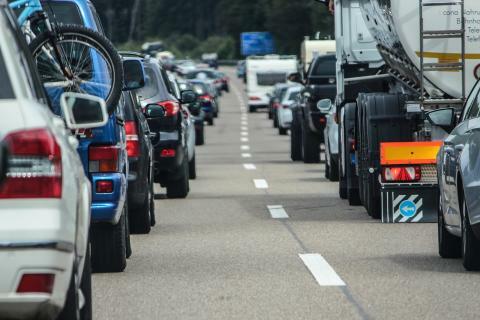 The true impact of traffic congestion on quality of life has been revealed by a new poll showing that commuters leave home an average of 13 minutes early every day to allow for jams on Britain’s roads. A study by polling agency Walnut Unlimited commissioned by The Go-Ahead Group, one of the UK’s leading public transport operators, highlights the level of inconvenience suffered by road users from worsening traffic and slowing speeds. By building in a 13-minute buffer on every morning journey, commuters are missing out on an hour and five minutes extra sleep a week, or just over 55 hours’ free time annually. Even with this buffer, many are still late – 40% of road commuters have been late for work over the last six months due to traffic jams, while 18% have been late for a family event. Perhaps the worst suffering are the one in 20 (4%) who admit to being late to a job interview thanks to a traffic jam. Official figures show that traffic congestion is getting worse, with delays on A roads up by more than 10% since 2014. Last year, the Centre for Economics and Business Research estimated that congestion would cost the British economy more than £300bn by 2030[i]. Martin Dean, MD of Bus Development at The Go-Ahead Group, said: “Traffic congestion causes frustration, anxiety and inconvenience. It hurts Britain’s productivity as well as affecting quality of life. “Public transport can be a part of the solution to that problem – a fully loaded double decker bus can take as many as 75 private cars off the road, easing congestion and improving air quality. Yet unfortunately we’re seeing many local authorities cutting back on funding for local buses as they face a budget squeeze. Congestion affects those who travel by bus as well as those who drive. Go-Ahead’s research finds that the typical bus passenger hits a tipping point of impatience after 20 minutes, 16 seconds in stationary traffic, prompting them to get off and walk. Asked what should be done to improve speeds on the roads, 51% of respondents advocated more investment in public transport, while 30% backed workplace incentives to subsidise bus travel. Only one in five (22%) suggested building more roads. All data, unless otherwise stated, is from Walnut Unlimited, the human understanding agency, part of the Unlimited Group. Source: Walnut Omnibus, a nationally representative omnibus survey of 2,051 adults across GB between 16 – 18 May. The figures have been weighted and are representative of all GB adults (aged 18+).